First cut a 6" x 9" piece of pink card stock and fold it in half for the base, a 4 1/4" x 5 3/4" piece of Stampin' Up! Crumb Cake for the front layer, a 1 1/2" x 4 1/4" piece of white for the strip's first layer, a 1 1/8" x 4 1/4" piece of pink for the strip, a 2 1/2" x 3 1/4" piece of pink for the image's first layer and a 2 1/4" x 3" piece of white for the image. Then use a Stamp a ma jig to stamp the butterflies on the 2 1/4" x 3" piece of white card stock in Stampin' Up! Crumb Cake ink. Then color them with Stampin' Up! Rose Red ink and a blender pen making the dots and shaded areas darker. Next stamp the accent in Crumb Cake ink then the sentiment in Rose Red ink. 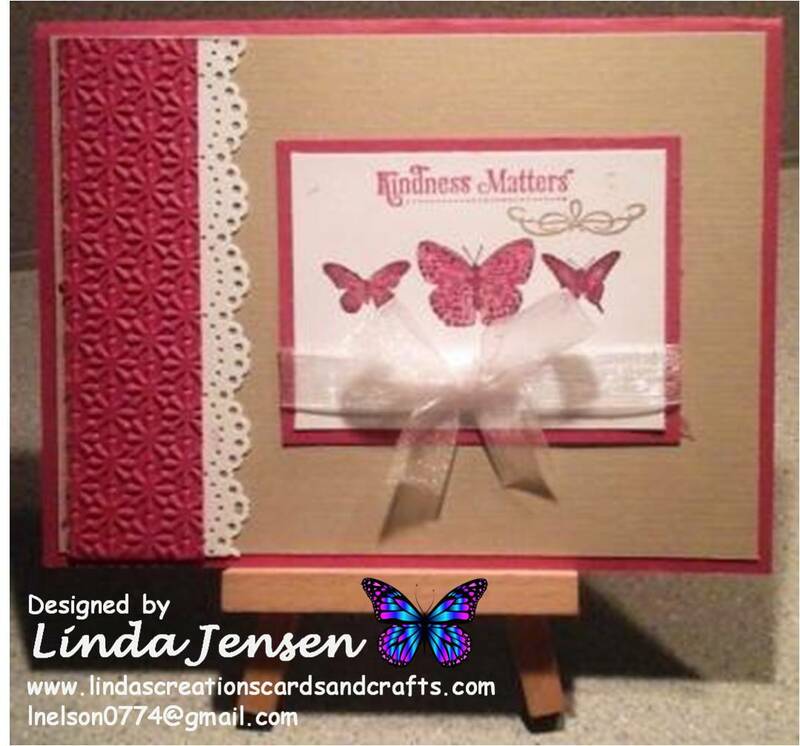 Next attach the butterflies to the 2 1/2" x 3 1/4" piece of pink card stock, add the ribbon and attach it to the front layer. 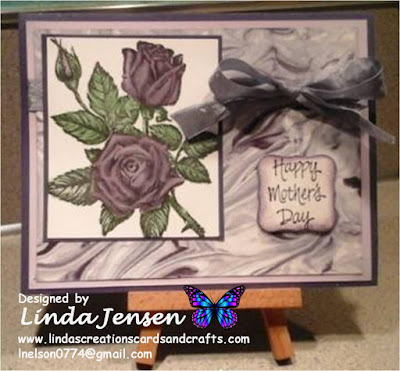 Then emboss a strip of pink card stock with a Stampin' Up! Snowburst embossing folder. Next punch the white strip with a Martha Stewart Doily Lace punch, attach the pink strip to the punched white strip then attach the white strip to the front layer. Next attach the front layer to the base and enjoy!